Yippee! It’s Copper River salmon season! I love, love, love wild salmon, but the best of the bunch is Copper River, which is available for a very short time May through June. It’s the most silky, rich salmon ever. It’s also the most expensive, but worth it, in my opinion. In honor of the season, I am posting our new favorite bowl recipe. 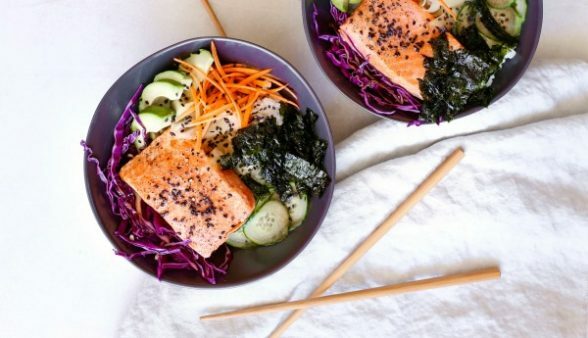 In all fairness, these aren’t sushi bowls because the salmon is cooked. But I’m putting the salmon on top of such rice with some of my favorite sushi roll ingredients, so let’s go with it. I am still completely obsessed with meals in a bowl especially on a base of hot rice or cauli-rice. Dinner-in-a-bowl has become popular in my house because everyone can make his or her own combo. And you don’t really have to follow a recipe, per se. 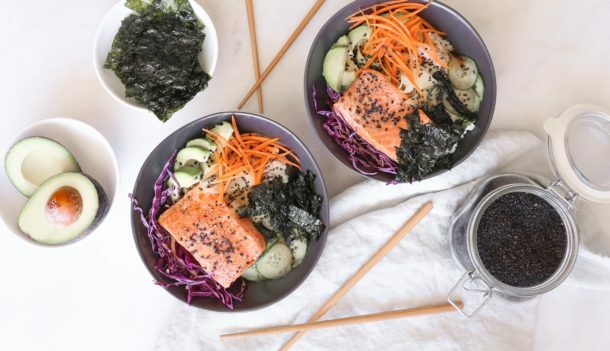 I’ve given you some instructions for the sushi rice, salmon and a quick soy-sesame drizzle to go on top, but after that you can whatever fresh or cooked vegetables you like. The sweet vinegar glaze on the same after it comes out of the oven is super delicious, so don’t skip that. In fact, my husband said it was his favorite part. Whatever gets him to eat fish is a winner in my book. 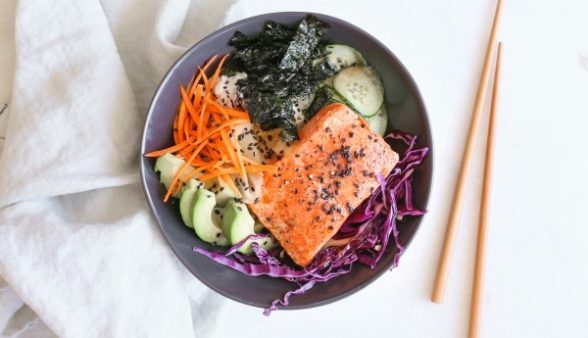 Wild salmon has tons of anti-inflammatory benefits – so many beautiful Omega-3 fats which are crazy good for brain and heart health. Wild salmon can have a strong flavor. 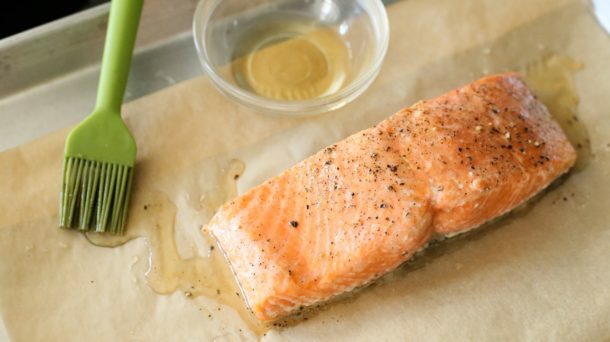 This quick brushing of maple and vinegar complements the fish beautifully and it’s so easy! You can use sushi rice picked up from your local restaurant or cook up some brown rice if you prefer. However you serve this, put out lots of colorful veggies and different textures – crunchy carrots, creamy avocado, crispy seaweed. You can also add a bit of wasabi paste to the soy-sesame drizzle for some heat. You can pull this healthy meal together really quickly and it will seem like something from a new trendy restaurant. I have a feeling this is going to be on repeat on your dinner planner! Make the rice: follow the package directions or rinse the rice in a fine mesh sieve until the water runs clear. Transfer to a small pot and add the water. Bring to a boil, lower to a simmer, cover and cook for 18 minutes or until the water is evaporated. In a small saucepan, warm 2 Tablespoons rice vinegar, sugar and salt and stir until sugar and salt are dissolved. Stir into the cooked rice. Set aside and keep covered. Preheat the oven to 400 degrees. 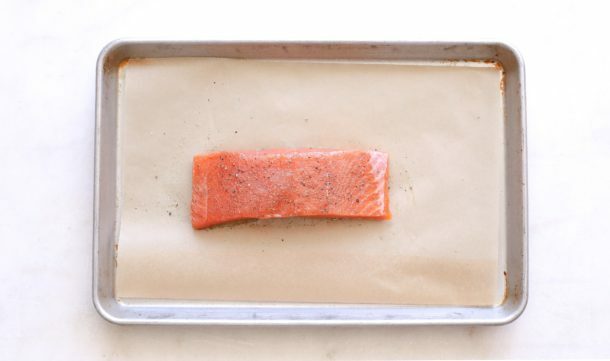 Line a large baking sheet with unbleached parchment paper. Place the fish on the paper and brush fish with olive oil. Sprinkle with salt and pepper. In a small bowl combine 1 Tablespoon rice vinegar and maple syrup. Set aside. Bake the fish for 10 minutes per 1 inch of thickness. When the fish is done, brush with the rice vinegar-maple syrup mixture. In a small bowl, combine soy sauce and sesame oil for drizzling on the bowls, if desired. 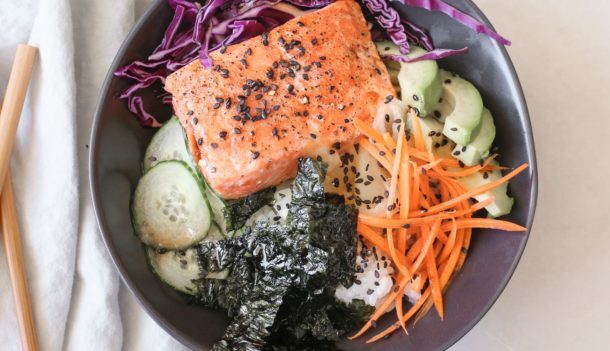 Everyone makes his/her own bowl with rice, fish, veggies, and pickled ginger. Drizzle a few teaspoons of the soy-sesame sauce. Don't forget to sprinkle sesame seeds and toasted nori on top. My whole family loved this including my picky 7 yo! Score! I know you said the season runs May-June but I am curious where you buy the copper river salmon at. I went on the website linked and it only shows suppliers in Alaska/Washington State. Is it distributed in SoCal? Yes, it is distributed in SoCal. I buy it at Santa Monica Seafood in Santa Monica and at Grow in Manhattan Beach. THIS IS THE MOST DELICIOUS MEAL EVER!!! So good. Thank you for posting.